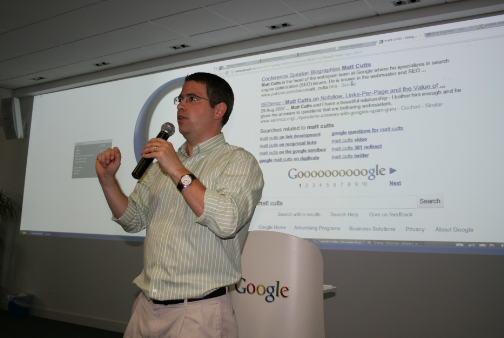 Matt Cutts was funny today. He had a show in Google’s office in Dublin in front of the strange crowd assembled by Dublin Chamber of Commerce. Matt is used to speak to the people who do not know much about SEO, but from the reaction from the crowd, I am not so sure how well received the presentation was. Was is the hottest weekend of the year so far that sucked life out of the audience? Was it the lunch people thought more than the presentation? Was it Matt’s unusual colours matching with green shirt with thin white stripes and some desert colour chinos? Matt was trying to be funny. I am not sure did it work for many in the audience. What I did notice was the goodies. Or the absence of them! 10 years ago, when you went to see the presentation of the top IT company, they would dress you up, and equip for your next golf game, and who knows what else. Google did something opposite. Mat actually took a pile of stickers from his pocket, and asked the lady in the front row to distribute them. They were a thumbnail size stickers, that Matt suggested you stick next to Inter Inside sticker on your laptop?! Now how cheap was that? Dublin Chamber of Commerce gave out questionnaire to everyone who was entering, but no pen to fill it? Recession is fine, but this was going too far – simple a very few feedback forms have been returned. The article on Irish Jobs Market deals on the personal branding as opposed to corporate branding Google adopted with Matt Cutts as their spokesman, as opposed to a CEO as a natural choice taken by most of the companies.